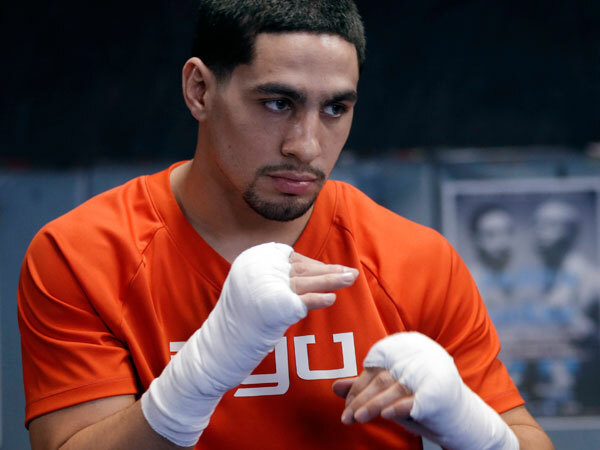 Two of Philadelphia’s top fighters held a media workout Tuesday as Danny “Swift” Garcia (30-0, 17 KOs) and Steve “U.S.S.” Cunningham (28-7, 13 KOs) prepared for their respective Premier Boxing Champions headlining events in August. Garcia, who was joined by his father and trainer Angel, will be looking for his record fifth main event victory at Barclays Center on Saturday, August 1 when he takes on former world champion, Paulie “The Magic Man” Malignaggi (33-6, 7 KOs) in a 12-round welterweight battle on Premier Boxing Champions on ESPN at 9:00 p.m. ET/6 :00 p.m. PT. “There’s no reason to go back in my career. The sky is the limit. It’s 147 for me now. I definitely feel a lot stronger. “I’m able to work on things now later in camp. Before I would just be coming in to lose weight. Now I’ve had great nutrition throughout camp. My legs are there and I’m faster. It’s all going to fall into place on August 1. “I’m not really concerned about Paulie, at this point in my career if I’m 110% percent ready, I feel like I can adapt to anything and find a way to win. “I couldn’t cut the ring off the way I wanted to at 140. Now I have more agility and I can really corner people, use the jab and control the fight. “My weight is great. I’ve been really disciplined with what I eat. I’m staying sharp and building muscle. I believe I could have been a welterweight two years ago. “He’s from Brooklyn, I’m from Philly. The fight makes perfect sense. All the Italian fans, the Puerto Rican fans will be coming in to see a great fight. He’s a former 147-pound champion, it’s going to be a great fight. “There’s no pressure on me. I just want to go in there and be Danny Garcia, a smart Danny Garcia. “I feel like my style matches up great with anybody at 147. I’m ready for Paulie Malignaggi. I know he’s coming into his hometown. It’s a big fight for him so I just have to be completely ready. “I moved up to 147 to fight the best fighters. Whatever the best fights are, that’s what I want. “Danny’s going to be ready on August 1 to show the world that he’s ready. The power is there. He’s coming like a lion in the night. He’s going to eat everybody up at 147. Tickets for the August 1 event, which is promoted by DiBella Entertainment in association with Swift Promotions, are priced at $250, $150, $120, $75 and $45, not including applicable service charges and taxes, and are on sale now. Tickets are available at www.barclayscenter.com, www.ticketmaster.com and at the American Express Box Office at Barclays Center. To charge by phone, call Ticketmaster at (800) 745-3000. For group tickets, please call 855-GROUP-BK. For more information visit www.premierboxingchampions.com, www.barclayscenter.com, www.PruCenter.com, www.dbe1.comand www.spike.com/shows/premier-boxing-champions. Follow on Twitter @PremierBoxing, @DannySwift, @PaulMalignaggi, @AntonioTarver, @USSCunningham, @LouDiBella, @ESPNBoxing, @BarclaysCente,@PruCenter, @SpikeTV and @SpikeSport and @Swanson_Comm and become a fan on Facebook at www.Facebook.com/PremierBoxingChampions, www.facebook.com/fanpagedannyswiftgarcia, www.facebook.com/PaulMalignaggi, www.facebook.com/barclayscenter,www.facebook.com/ESPN , www.Facebook.com/PruCenterand www.Facebook.com/Spike. Follow the conversation using #PBConESPN and #BrooklynBoxing. Previous TARVER STILL CHASING THAT #1 SPOT!